The beautiful dome of a Greek Church is nestled amidst a small copse of cypress trees. The cross is accentuated by the deep yellow sunset and a hint of flowing water ripples below the church. 'Greek Church 1' is a one off monotype print, printed on Snowdon Cartridge paper with oil based inks. I created 'Greek Church 2' as a group of monoprints in one day, using paper cut outs, torn paper and pieces of bark to give texture to the vertical shapes. I inked up a metal plate, then inked up the paper cut outs and bark in different hues and overlapped them on the plate before running them through the manual press onto paper. I am a member at the Double Elephant Print Workshop in Exeter, England and use the intaglio press there. The beautiful dome of a Greek Church is nestled amidst a small copse of cypress trees. The cross is accentuated by the deep yellow sunset and a hint of flowing water ripples below the church. 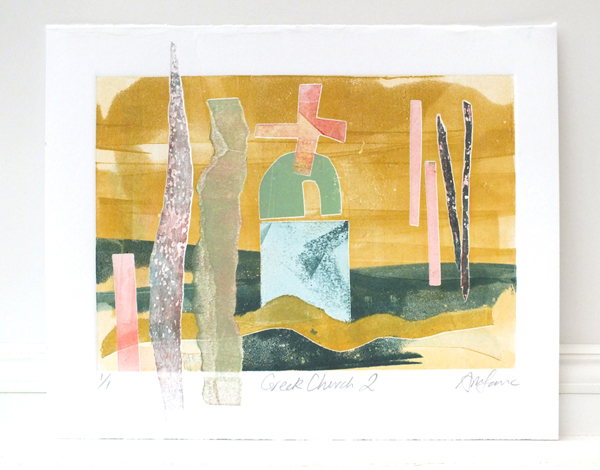 'Greek Church 3' is a one off monotype print, printed on Snowdon Cartridge paper with oil based inks. The beautiful dome of a Greek Church is nestled amidst a small copse of cypress trees. The cross is accentuated by the deep yellow sunset and a hint of flowing water ripples below the church. 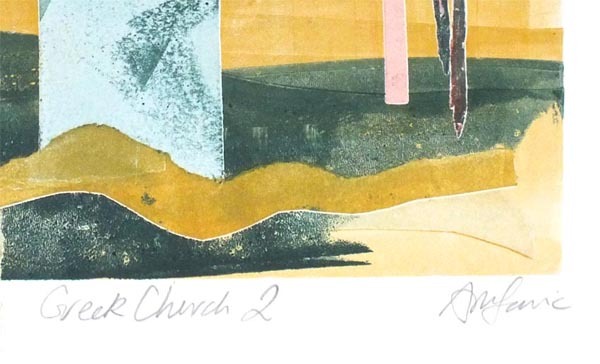 'Greek Church 4' is a one off monotype print, printed on Snowdon Cartridge paper with oil based inks. The beautiful dome of a Greek Church is nestled amidst a small copse of cypress trees. The cross is accentuated by the deep yellow sunset and a hint of flowing water ripples below the church. 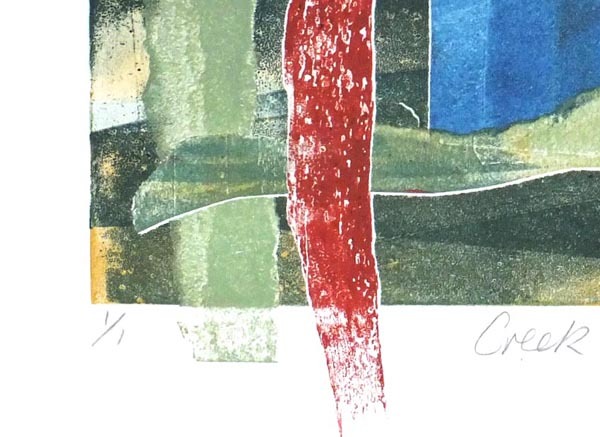 'Greek Church 5' is a one off monotype print, printed on Snowdon Cartridge paper with oil based inks. Previous impressions add shadowy richness and so each print is unique but posses the same shapes and qualities. A whimsical image of an imaginary landscape in blue, pink and green, with a mysterious tower using the monoprint and drypoint techniques. I created the coloured parts of the image first with monoprint and then made a drypoint on perspex to give the black line drawing. A whimsical image of an imaginary landscape in purple, blue, pink & green, with a mysterious tower using the monoprint and drypoint techniques. I created the coloured parts of the image first with monoprint and then made a drypoint on perspex to give the black line drawing. A whimsical image of an imaginary landscape in blue, pink & green, with a beautiful tree using the monoprint and drypoint techniques. I created the coloured parts of the image first with monoprint and then made a drypoint on perspex to give the black line drawing.